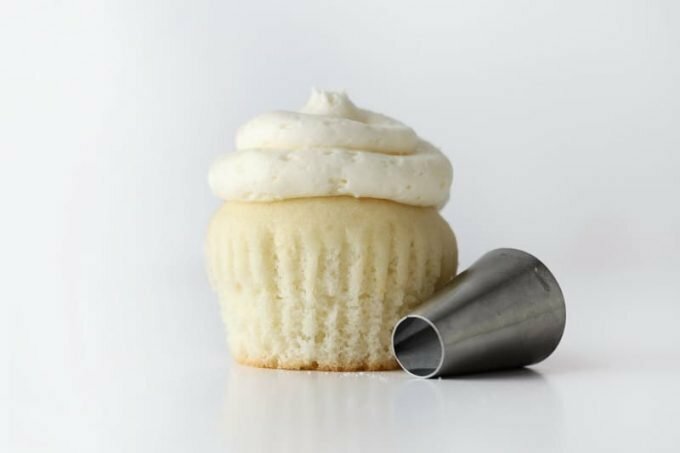 These white wedding cupcakes turn a boxed cake mix into the most amazing vanilla cupcakes you’ve ever had. They’re a close replica to a delicious bakery cake that you would find at a wedding (with the perfect texture!) 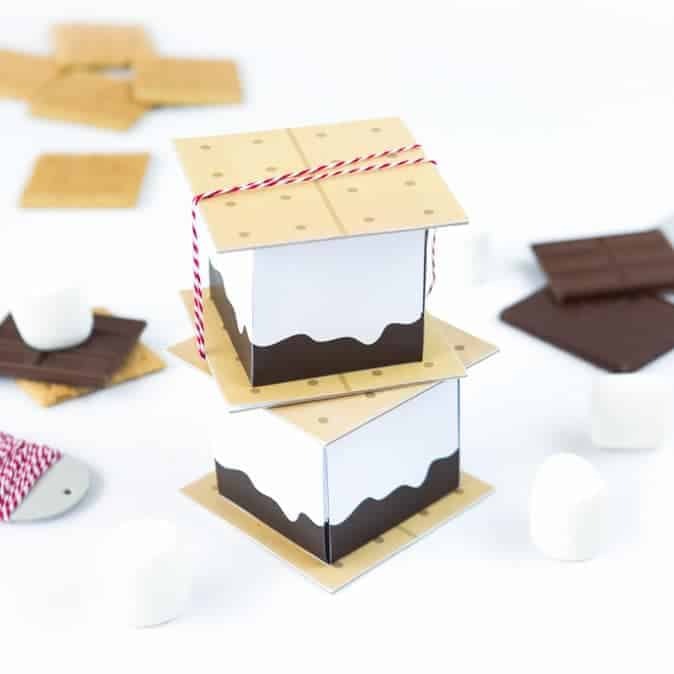 and are so easy to make! 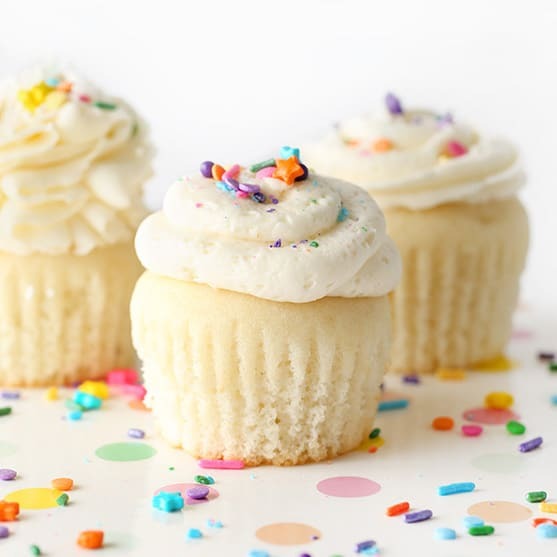 It’s become my family’s favorite go-to vanilla cake recipe anytime cupcakes are in order. Being a chocolate fanatic, it’s a rare occasion that I would choose anything vanilla over chocolate. But these white wedding cupcakes are THAT good, that even I would choose these over a chocolate cupcake 100% of the time. 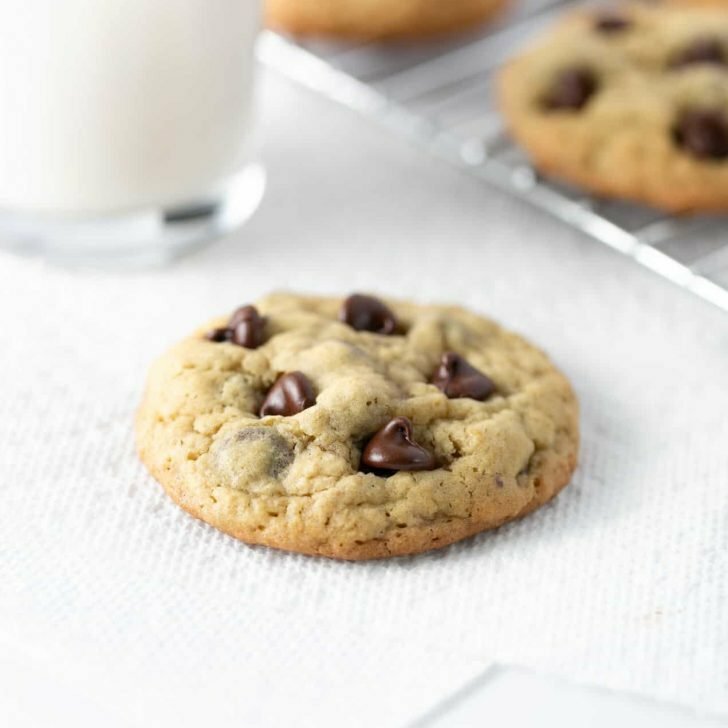 They are so moist, so easy to make, and of course…so very scrumptious. Having a cake mix base, this recipe is kick-started for you so you don’t have to worry about leavening agents. I prefer to use an “extra-moist cake mix” to ensure they come out as perfect as possible. Because dry cupcakes = no bueno. 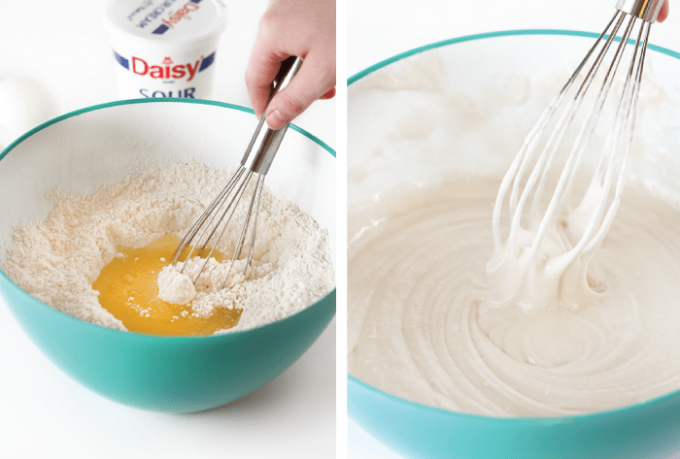 Start by mixing the dry ingredients with a whisk. Once combined, mix in the egg whites, sour cream, and water and continue mixing until combined. 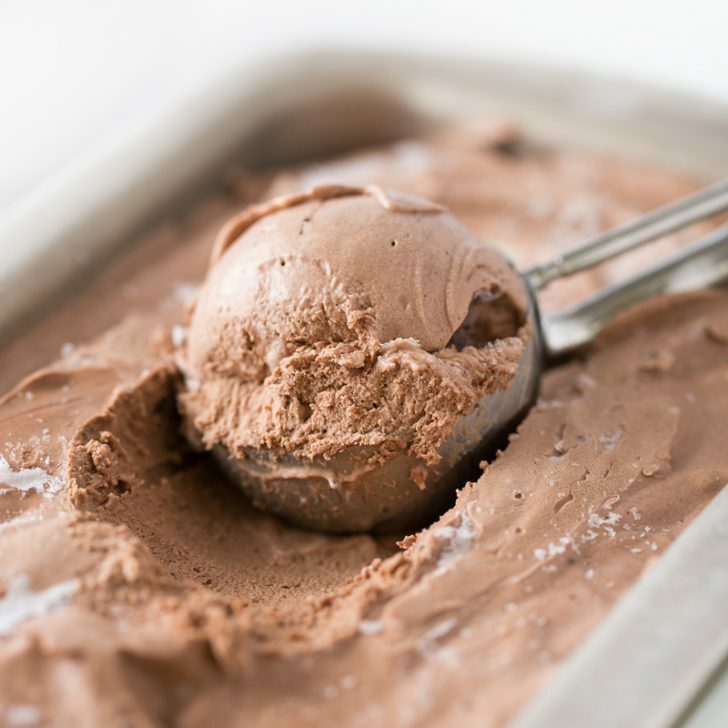 You can use a electric mixer, but whisking by hand works well for this recipe. 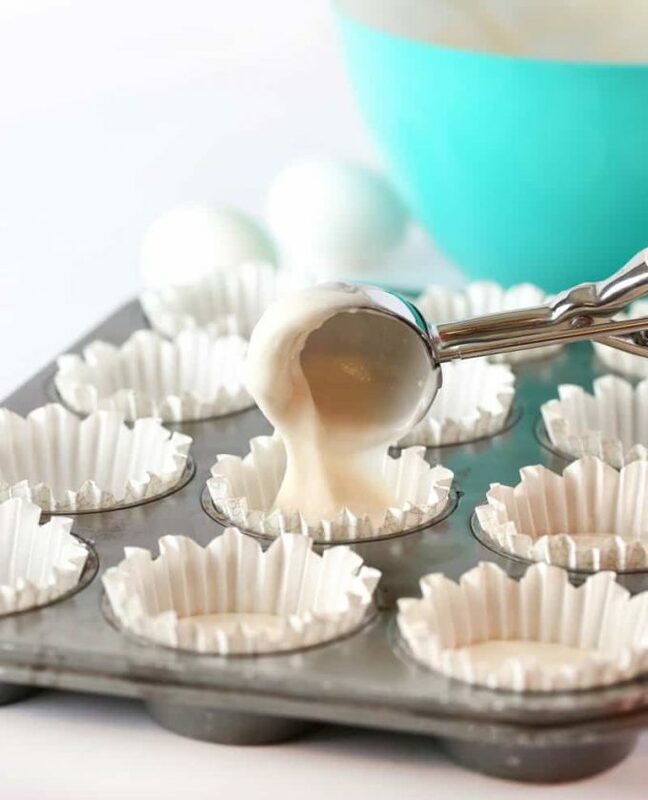 Use a 3-tablespoon sized cookie scoop to scoop the batter into the baking cups. Bake for 18-20 minutes or until toothpick comes out dry. You do not want the tops to turn brown, as that will mean you overbaked them. The tops will still look a little moist, but the goal is to cut into them and see this beautiful, perfect, bakery texture. My personal favorite frosting for these is a delectable cream cheese frosting. 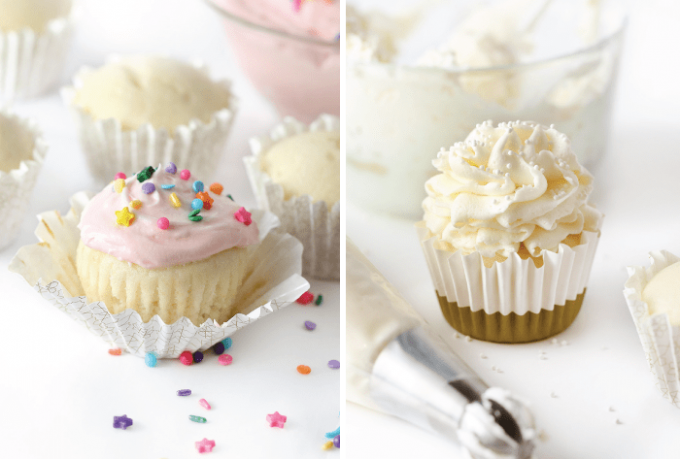 It’s not too sweet and is the perfect pairing with these vanilla cupcakes. 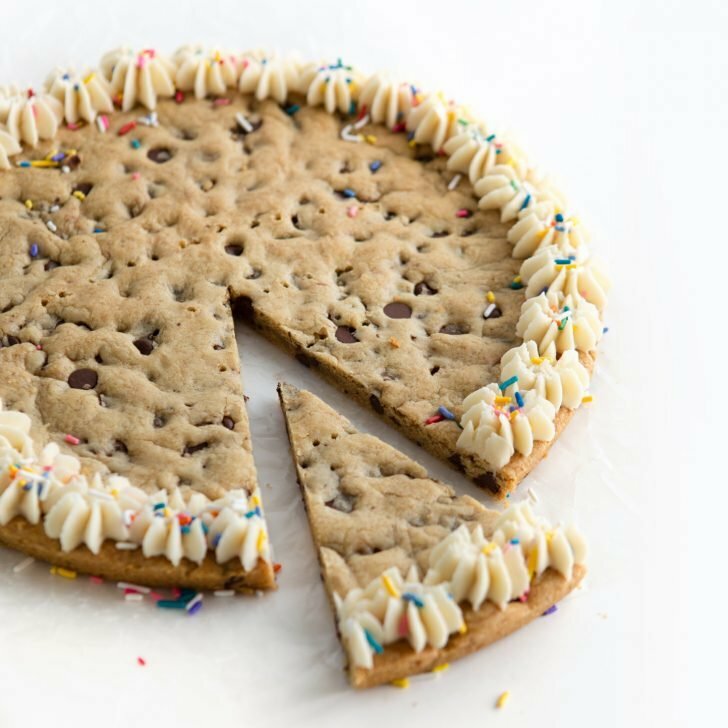 If you want a more pipeable frosting, try out a buttercream frosting like I use on sugar cookies. What brand of cake mix do you recommend? 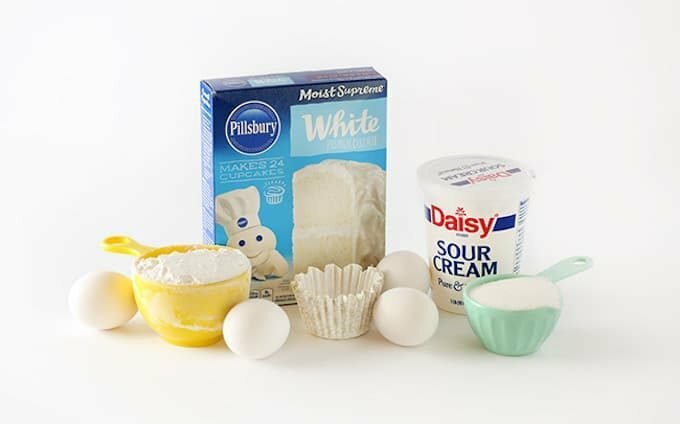 I used and prefer Pillsbury White (Moist Supreme) but I’ve tried it with several other mixes and it works fine. What’s the difference between this recipe and a cake mix straight-out-of-the-box? You might be thinking, “what’s so different about this recipe if you are still using a boxed cake mix?” Well, I will tell you. The secret is sour cream and egg whites. Yes, sour cream ain’t just for baked potatoes anymore. It is used to moisten many types of cakes/batters and any time I’ve used it, the result has always been amazing. And the egg whites? Since you are removing fat content (by taking out the yolk), you need to use the sour cream to balance that back out to produce a soft & moist cake. 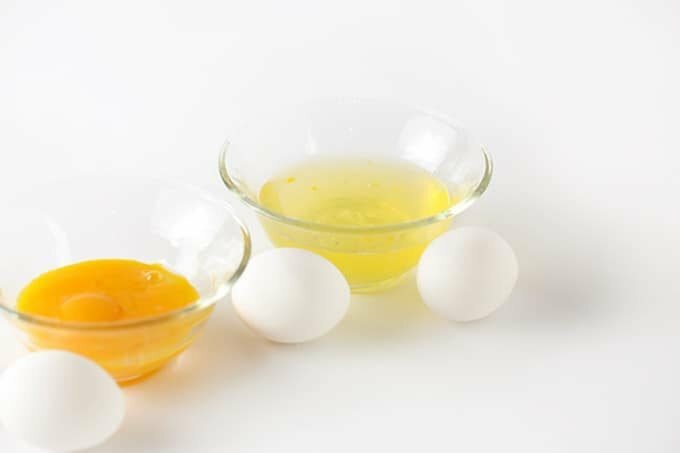 Tip: Save the egg yolks in a plastic bowl (covered with saran wrap) and toss into a big batch of scrambled eggs in the morning. Or use the liquid egg whites you can buy in a carton to avoid having leftover egg yolks. 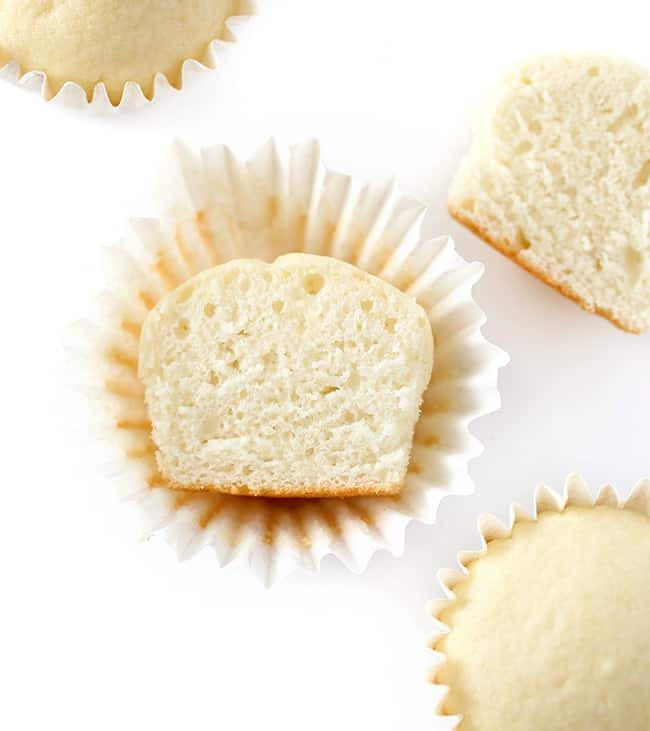 Where did you get those adorable scalloped cupcake liners? 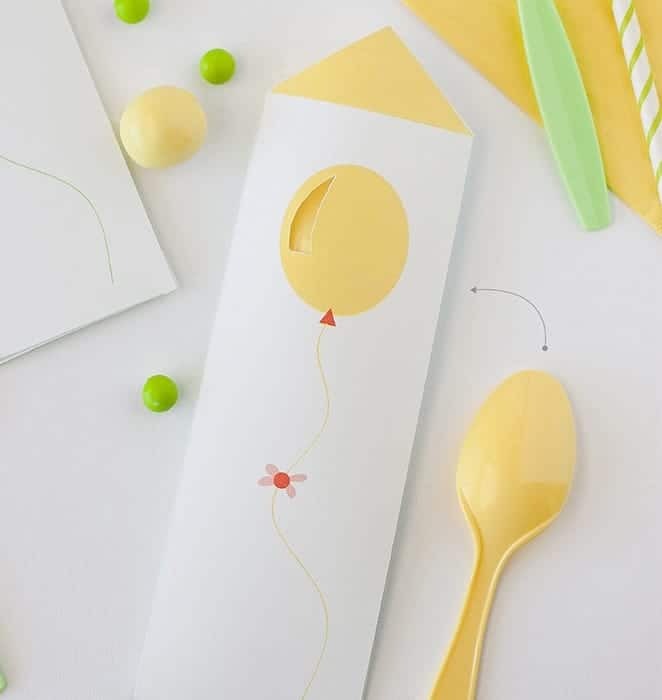 These are from The Sweet Tooth Fairy’s adorable baking line! They’re grease-proof and make the cupcakes come out of the wrappers SO smoothly. 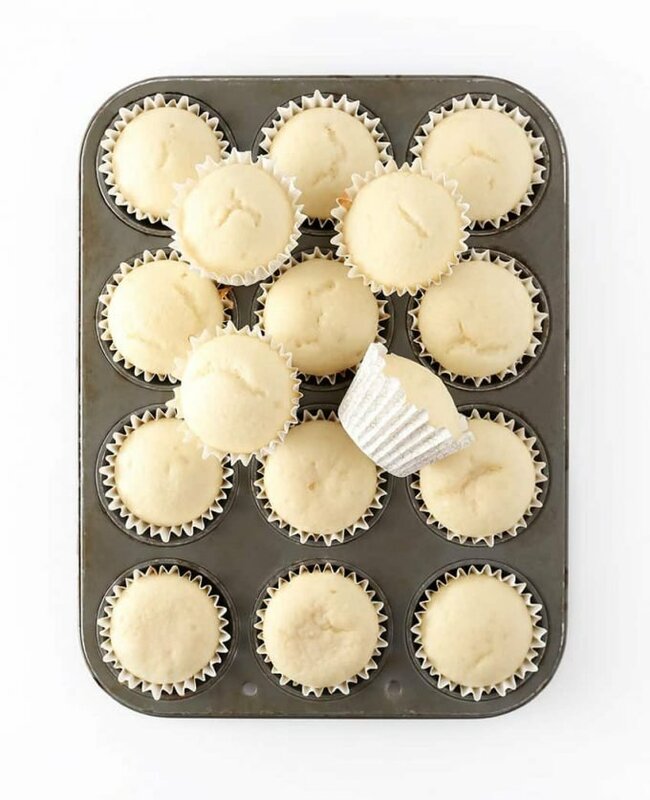 Assuming you fill each baking cup with 3 tablespoons of batter, this recipe makes 24 cupcakes. Can I use this recipe as a cake? Yes! Bake in a 9×13 pan for 28-30 minutes or until toothpick comes out clean. 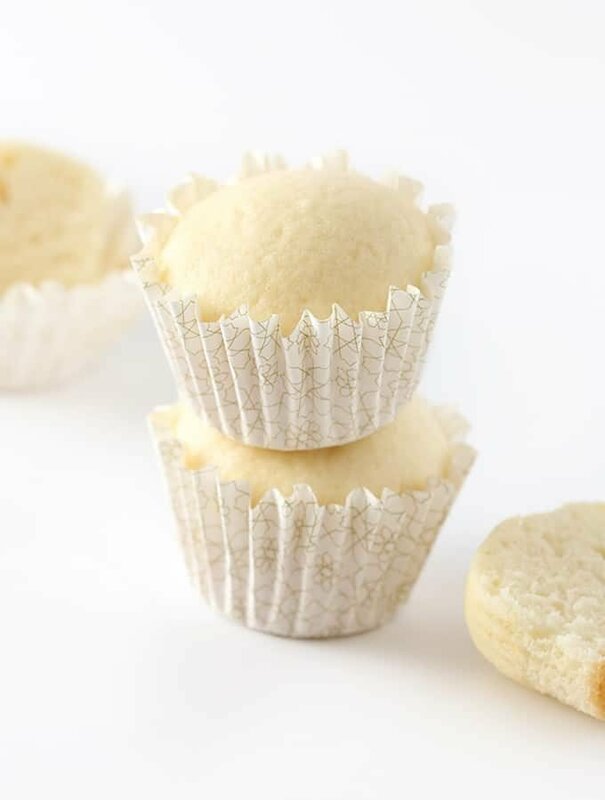 These white wedding cupcakes turn a boxed cake mix into the most amazing vanilla cupcakes you've ever had. They're a close replica to a delicious bakery cake that you would find at a wedding (with the perfect texture!) and are so easy to make! It's become my family's favorite go-to vanilla cake recipe anytime cupcakes are in order. Pair with cream cheese frosting (my favorite!) or a more pipeable buttercream frosting. In a large bowl or stand mixer, whisk together cake mix, flour, sugar, and salt. Once incorporated, add in the vanilla, water, sour cream, and egg whites one at a time until combined. 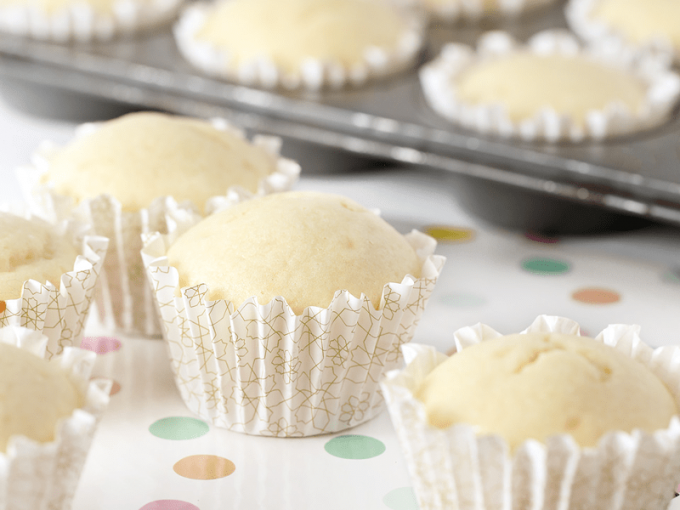 Place cupcake liners into cupcake tin and scoop 3 tablespoons of batter into each baking cup. Bake for 18-20 minutes or until toothpick or fork come out clean. To turn this into a 9x13 cake, bake at 350 for about 30 minutes or until toothpick comes out clean. Buttercream Frosting recipe can be found here. Tag me on Instagram @designeatrepeat or leave a comment below to let me know how it turned out! I love seeing what you’ve made. SHUT UP!!!!!!!!!!!!!!! Wedding cake is literally the greatest cake of all time. OMG!! I am literally drooling! These look SO amazing. Gorgeous photos as well. I want one right now! Maybe I will make them tonight :) Thanks for the recipe. 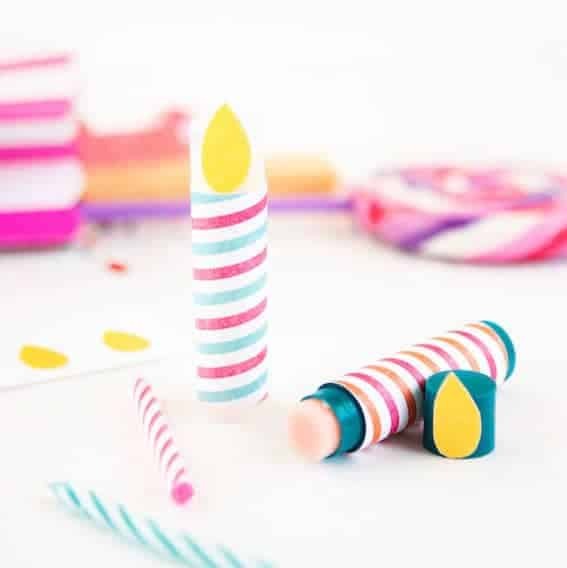 I don’t know if I’m more excited about the straws or the actual cupcakes! Love this! My grandma makes cheesy potatoes on Easter too! :) I think she uses a Paula Deen recipe. And those cupcakes look delicious. 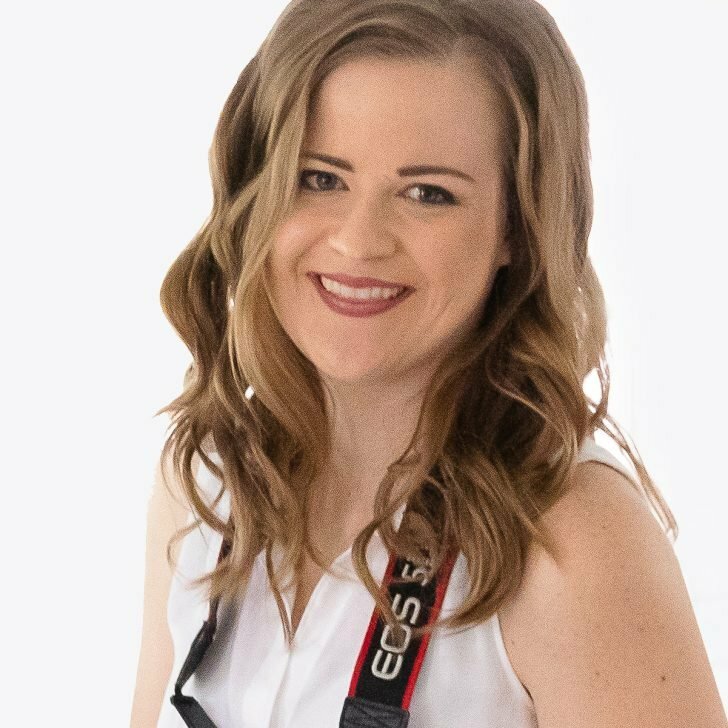 I’m Melissa - a Graphic Designer & Paper Crafter creating easy-to-assemble printables, party DIY's, and food crafts for family fun.